Kuching, situated just inland of the northwest coast of the island of Borneo, offers retirees with a sense of wanderlust a generous helping of laid-back charm along with a high standard of living, all for a downright bargain cost. Kuching offers unlimited opportunities for outdoor enthusiasts. This is the land of endangered proboscis monkeys, orangutans, the world's biggest flower, and the elusive hornbill. Some of the world's largest remaining virgin rainforests can be explored in the many national parks just a short distance from the city. However, this isn't about jungle living. Kuching is a pleasant and modern city. On your less adventurous days, you could relax on pristine beaches, be pampered in a spa, play a round of golf, watch the latest Hollywood films, or enjoy a day shopping at one of the many malls and specialty shops in the city. 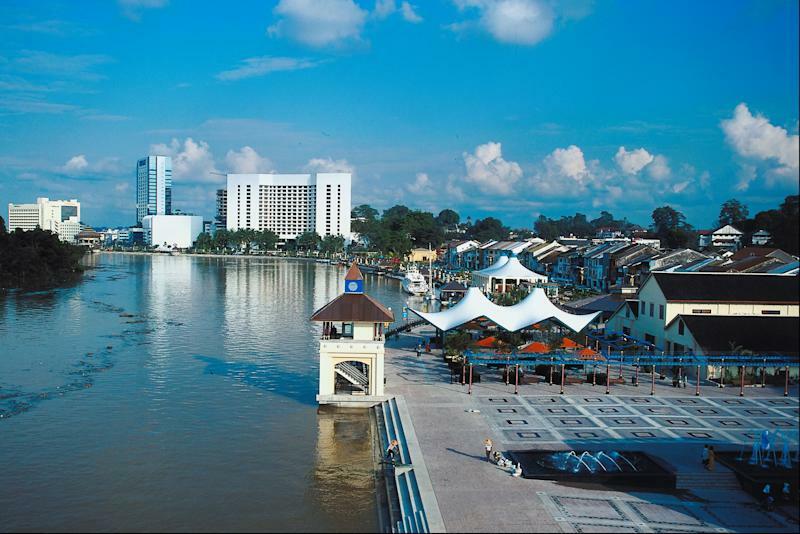 The name Kuching is derived from the Malay word for "cat," and feline lovers will find themselves in good company here. The city is proud of its cat statues and cat museum and seems to have a certain lazy and content feline quality about it. In fact, Kuching may be the perfect off-the-beaten-track retirement destination. Incentives for permanent residency are even more generous here than they are in the rest of Malaysia, and the cost of living can be less than $600 a month for a home-owning couple. But Borneo? Where in the world are we talking about? Kuching, the capital of the state of Sarawak, is situated very near the equator in the northwestern part of Malaysian Borneo, the third-largest island in the world. Sarawak is bordered on the south by the Indonesian state of West Kalimantan and on the east by the tiny oil-rich country of Brunei. The South China Sea lies directly to the north of Kuching. Sarawak, with a total population of about 2 million, is the largest in area of the 13 Malaysian states. It has 420 miles of coastline and an extremely rugged interior, much of which is still covered in primary rainforest. Kuching itself, though, is a pretty city that presents a comfortable blend of neo-classical British colonial forts, museums, and government buildings, Chinese-style churches, shop-houses and temples, and unique Borneo-style arts and crafts. It's an eclectic mix. One of the many things that make Malaysia in general such an appealing retirement option is its high standard of health care. Hospitals are well-equipped and modern, and most medical personnel speak fluent English. In addition, health care costs are very low, and the quality of care tends to be excellent. Since Malaysia does not have any medical schools, all physicians practicing medicine here have received their education abroad, mainly in the European Union, Australia, New Zealand, Canada, and the U.S. Health care is of such a high standard and so reasonably priced that Malaysia is one of the world's top medical tourism destinations, with visits growing at a rate of 30 percent annually. Kuching has other attributes that make it a pleasant, comfortable, nice place to be. It is one of the cleanest cities in Malaysia and has been recognized by the United Nations, the Alliance for Healthy Cities, and the World Health Organization for this achievement. English speakers will have no problem communicating in Kuching, as English is an official language of Sarawak. Foreign home buyers enjoy special incentives with the My Second Home Program in Kuching and select other cities in the state of Sarawak, and are permitted to purchase property at a lower minimum investment than in any other state in Malaysia. If living in a modern city in the heart of "wild" Borneo piques your imagination, you'll find that Kuching will exceed your expectations. Outdoor enthusiasts will delight in the pristine beaches, virgin jungles, and unparalleled exotic wildlife, as well as the opportunities for golf and hiking in the cool highlands. Retirees preferring city life will be heartened by plentiful shopping, museum hopping, and abundant culinary delights. Whether you prefer the cosmopolitan life or the great outdoors, you'll be immersed in the unique culture of this region, interacting with the indigenous community and gaining appreciation for the distinctive arts and traditions of a people found nowhere else in the world.